The European Investment Bank – the EU’s non-profit lending body – is providing €155m to finance the WB Yeats and a larger new passenger vessel, which will be the world’s biggest, for Irish Ferries. Both parties said that the two ferries will increase passenger and cargo capacity on routes to Ireland, replace older and smaller vessels and significantly reduce greenhouse emissions. The new ferries are expected to be used on both the Dublin-Holyhead and Dublin-Cherbourg routes to reflect demand for a greater choice of services from Ireland to Britain and direct to continental Europe as concerns of a hard Brexit grow. Andrew McDowell, European Investment Bank Vice President, and Eamonn Rothwell, CEO of Irish Continental Group. The announcement was made as the WB Yeats ferry made its maiden voyage from Dublin to Holyhead. 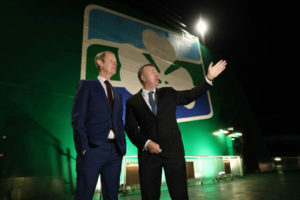 The largest ever EIB support for Irish shipping was announced during a visit by Irishman Andrew McDowell, European Investment Bank Vice President, and Eamonn Rothwell, CEO of Irish Continental Group, the parent company of Irish Ferries. WB Yeats was partly financed using €75m from the EIB. It can hold 1,800 passengers, 300 cars and 165 trucks. The second ship, expected to be completed in 2020 and unnamed as yet, will likely transport 1,800 passengers and crew and 1,526 cars or 300 trucks. Due for delivery during 2020, the second ship will be the largest cruise ferry in the world in terms of vehicle capacity and provide Irish Ferries with an effective 50pc increase in peak freight capacity.